Lenovo reveals a new IdeaPad 320S-13IKB (R) forged to combine performance and affordability. This compact 13-inch ultrabook concentrates its productive office vocation around a solid Quad i5 Kaby Lake Refresh of last generation, 4 GB of RAM and a fast dedicated SSD of 128 GB, a guarantee of reactivity. A matte Full HD IPS screen, a USB Type-C connection and measurements contained complete the set under a shell favoring sobriety. 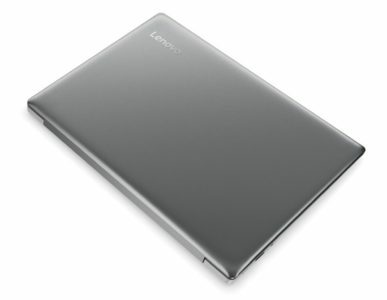 Lenovo Ideapad 320S-13IKB ignored positioning “mid-range” and settles in a well assembled and robust chassis, consisting of aluminum (back cover) and matt plastic (base). Entirely covered with a slightly darker gray color on the back (Mineral Gray), the ultrabook opts for a simple and neutral design without any particular finish. Moreover, with 1.2 kg on the scale and 16.9 mm thick, the ultrabook will not be against some displacements. Good extra point, its keyboard is backlit for easy typing in dark atmosphere. Autonomy issue, this Lenovo IdeaPad 320S-13IKB should turn about 6 hours in Internet browsing via Wifi before surrender. Its most innocuous appearance is far from reflecting these performances. Indeed, the Lenovo Ideapad 320S-13IKB hides a quad Core i5 low power consumption of last generation (Kaby Lake Refresh) assisted by 4 GB of RAM . This duo is perfectly comfortable with office and multimedia tasks, including surfing the Internet, playing videos, working on Office or photo editing (Photoshop, Lightroom). It can also tackle other missions a little more demanding (Adobe Premiere) in reasonable proportions. On the other hand, multitasking enthusiasts will have to reduce their requirements because of the rather low RAM. As a player in the global reactivity of the ultrabook, the dedicated SSD is faster, quieter and energy efficient than its cousin the hard drive. In fact, it causes a particularly responsive execution of the system and significantly shortened loading times for Windows 10 and all programs. Its capacity of 128 GB is however rather limited to archive your data, involving the use of an external solution (hard disk, memory card) or an online storage system. The screen is also far from indifferent. Based on an edge-to-edge IPS mate panel, it sports a dense Full HD (1920 x 1080 px) definition that gives you the freedom to enjoy your High Definition content and to modulate the onscreen display of windows. The comfort is at the rendezvous thanks to wide viewing angles, a colorimetric spectrum respected and a matt surface that improves visibility in high ambient light. The connectivity is satisfactory and well positioned with two standard size USB ports, a USB Type-C port, an HDMI output, a microSD card reader, a headphone jack and a Kensington lock. Namely only one USB 3.0 is present and the USB Type-C does not support the Thunderbolt 3 but it\’s not really a surprise given the segment of the PC. Recent generations of WiFi AC and Bluetooth 4.1 modules are also on the menu.